My oldest son, TJ went to his first day of high school today. I’ve worked with high school students in the church for 17 years as a full-time youth pastor and now I finally have one in my house. It’s weird, exciting, faith stretching, and perspective warping already. I’M PASSIONATE ABOUT MAXIMIZING THESE NEXT 4 YEARS. Today I re-uped my commitment to deeply care about the student ministry we are doing at our church. It has always mattered to me, but for obvious reasons, the reality of what’s at stake has a new face for me. I re-uped my commitment to meeting weekly one-on-one with TJ like we’ve done the last 3 years. I re-uped my commitment as a Dad to make the sacrifice and investment it will take to invest my best time into the privilege of parenting. I’M ACUTELY AWARE THAT TODAY MARKS A NEW DECADE FOR US. For the next 10 years, the Berrytribe will have at least one of our kids in high school. Wow. That’s a lot of high school years ahead of us. At year 6, we’ll have a senior, a sophomore, and 2 freshman in our house. HAAA! I’M NO LONGER “TELLING PARENTS HOW TO DO WHAT I’M NOT DOING”. I’ve worked hard for 2 decades to be in that place. I’ve apologized and backpedaled my way out of giving advice to parents of high school students because I have not done it. Even 10 years from now, I won’t have some magic wand or be able to give advice without the humble truth that I don’t hold the answers to to the task of parenting teens. But with every passing day of the next 3650, my credibility as a pastor who is walking in a high school parent’s shoes, for better or for worse, will only increase. I know everyone says this, but I swear, my son was born yesterday. 14 years went WAAAAAY too fast. My youngest will be freshmen tomorrow. I gotta continue to freeze me some moments in time. For years I thought that this day would mark a day that I might need to bow out of youth group. In an effort to give my own high school students the space to own their faith, I thought I might need to call it a day on this day. But after a summer of ministry together, I’m even more committed to doing life with my own high school students while leading with them in the risk and faith filled experience we call Student Ministry. Today was truly a new day on the job for me. Pray it up people. 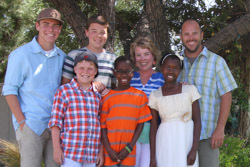 My family needs a decade of your help and a 5 fold dose of grace from the Lord on this one.